First, a log10 transform was performed on the observed flow record to reduce the strong positive skew of the flow record and make the skew characteristic close to that of the predictor chronologies. Then forward stepwise multiple linear regression was used to regress the log10 of calendar year streamflow on five tree-ring chronologies from north-central New Mexico. Four different models were tested: using residual or standard chronologies, and using the chronologies themselves or principal components (PCs) derived from them. The model which performed the best was based on the PCs (PC1 and PC2) from the residual chronologies, with the low-order autocorrelation removed. Validation statistics were computed using both a leave-one-out (cross-validation) approach, and a split-sample approach. Figure 3. Reconstructed annual flow for the Santa Fe River (1305-2007) is shown in blue. Observed flow is shown in gray and the long-term reconstructed mean is shown by the dashed line. Figure 4. 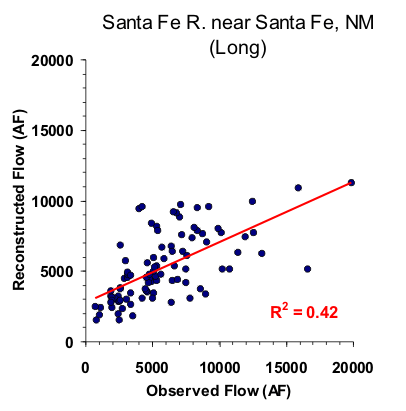 The 10-year running mean (plotted on final year) of reconstructed Santa Fe River flow, 1305-2007. Reconstructed values are shown in blue and observed values are shown in gray. The long-term reconstructed mean is shown by the dashed line.